Titian was one of the most famous and accomplished Italian painters of the Renaissance. His masterpiece, The Entombment, was painted around 1520 for the family of the Dukes of Mantua. It now hangs in the Louvre Museum in Paris. Titian’s brilliant composition displays the intense emotions of those present at Jesus’s entombment. The grief of Mary, Jesus’s mother, is wrenching as she is comforted by the horrified Mary Magdalene. The face of the apostle, John, who holds Jesus’s right hand, is full of anguish. Joseph of Arimathea, a wealthy Jew who offered his own tomb for the burial, is the figure in the rich red robes and Nicodemus, a rabbi dressed in the black robes of the scholar, is the figure holding Jesus’s feet. While I was studying art at the New York Studio School, our graduating thesis was to “transcribe,” or replicate a master painting in our own way. Titian’s entombment of Christ stilled my heart and I set out to paint this moment of great import as best I could. A strange thing began to happen. Other students in this international school would drop by my easel and ask questions about the subject matter. All had certainly heard of Jesus, but details were dim of his crucifixion and resurrection. It was my profound privilege to tell and retell the story to my fellow students. 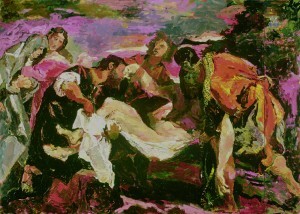 My “transcription” of The Entombment is now in the permanent collection of St. Paul’s Episcopal Cathedral, San Diego, California. I am quite enchanted with what you changed in your painting – putting color in the background, for example. I AM SO PROUD OF YOU. YOUR PAINTING IS BEAUTIFUL. Have a grateful and serene Easter. I’ve never thought of doing replication in my own style, only when i attended a school was asked to paint something (anything) replicating as best possible a master’s style. Have you done more replications? I find this an interesting process especially knowing your style. I know other artists have done this but it’s the classical piece and your style that intrigues me. More?? Thanks, Geoff! Does this remind you of Studio School days?! Thanks Kirby for sharing this painting and yours and for sharing the good news with others! Well Kirby lou, You are a super Star on the canvas-We are so Proud of you and Roberto, the 10 Gal Cowboy that stole you away! Come to the River and we will give you a rest! I remember the Glastonbury Thorn in a long walk to Chalice Well, which Joseph of Arimathea is supposed to have visited. Chalice Well’s reddish waters recall the Last Supper’s wine. Kirby, Thank you for sharing your story of Christ’s burial. Your transcription of Titian’s, The Entombment, is stunning. Your painting touches my heart and reminds me of my own Christian faith. God bless you and your family with happiness and health. Titian, to me, is of another world. Kirby, I thoroughly enjoy your painting of the scene he depicts – the colors, the feelings that the imaging project.. your own view of this immortal scence. That’s about it for me. I find learning of art, through your prism, great. thanks for commenting, Marlin! We’ll keep em comin’! I look forward to receiving your blogs. This one was especially touching to rec eive just before Easter. I got out my magnifier so I could better see the faces in your picture. The way you are tying your paintings to the masters is providing art history for all that receive your blog. Thank you, Lucille! I love picturing you with your magnifier! Happy Easter to you too Kirby! Thanks for sharing your beautiful painting! 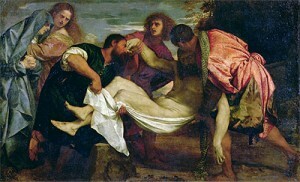 Titian was a masterful master. So is KK. I would suggest that “Jesus” needs ONLY an apostrophe after the “s”, to show possession.The “Jesus'” is plenty. “Jesus’s” is redundant. While Titian’s painting is certainly a masterpiece, I prefer yours. The colors are more intriguing and the piece seems more alive even though it’s about death. Happy Easter!